Roasted Chicken is one of the easiest one pot dinners you can prepare. Roasted Chicken is one of the easiest and flavorful one pot dinners you can prepare. The bonus are the many meals you can make from your juicy Roasted Chicken leftovers! Whether you eat the leftovers for lunch or dinner you have a number of choices for future meals. Try our Chicken Caesar Salad, Enchiladas, Fajitas, a Quick Chicken Soup, or dice up the chicken add a little of your favorite may, red onion and diced celery to make a satisfying chicken salad sandwich. Chicken has many wonderful benefits for those who eat it. Not only does chicken provide us with a good supply of lean protein, it’s heart healthy and helps regulate healthy cholesterol levels. And there is more good news for eating chicken. Check our the 7 impressive Benefits of Chicken. 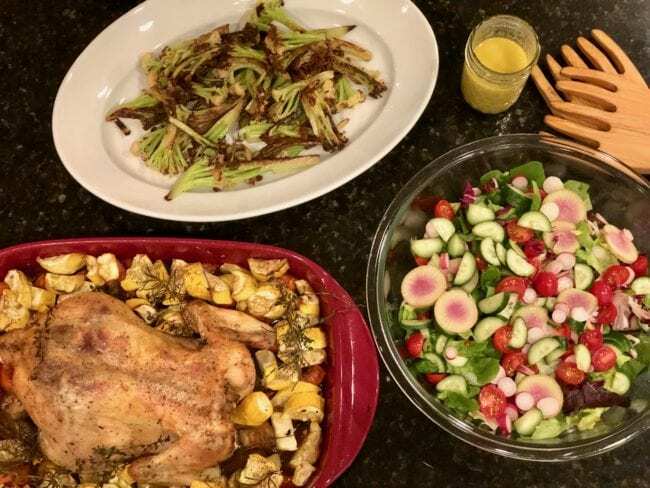 Watch our Roasted Chicken video below and see how simple and delicious this recipe is to prepare. For the full recipe keep scrolling down. Preheat oven to 400 º Place oven rack in lower third of oven. In a small bowl mix 1/4 C olive oil with salt and dried herbs. Wash the bird inside and out making sure water runs clear. Pat dry. Place cleaned bird breast side down in a 9 x 13 glass, ceramic or other baking/roasting pan. 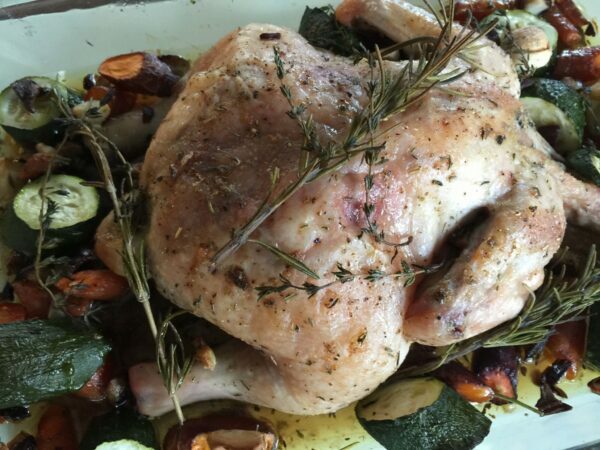 Rub herbed olive oil all over and around chicken, even carefully under the skin of the breast and thighs. Scatter all the rough cut vegetables around the bottom of the pan. Drizzle olive oil and Celtic salt over the vegetables. Fresh pepper over the bird and veggies. Roast for 15 minutes at 400 degrees, then turn oven down to 325º and continue roasting for 1 hour. Chicken should be nicely browned and juices run clear when poked. 15 minutes per pound. Remove from oven and let rest covered for 10-15 minutes before carving. The chicken continues to cook as it rests and the juices permeate the meat. This will make for a moist and tender bird. Leave whole on the platter or cut into pieces. 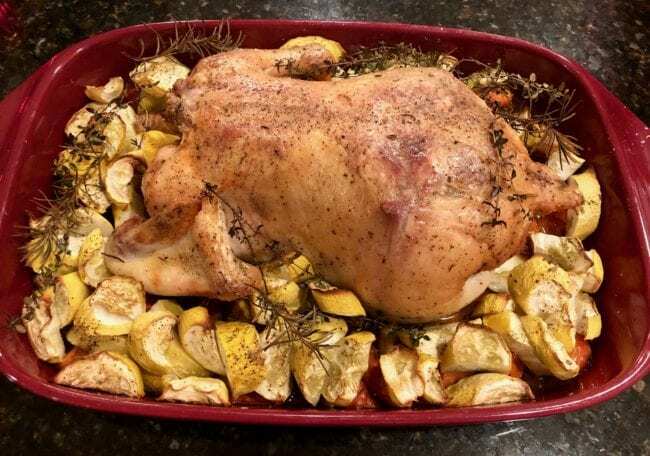 Place roasted vegetables all around the chicken to serve. Pour pan juices over the chicken and vegetables or serve the juices in a separate small container. NOTE: Another ways to roast a chicken is to use a stainless steel stand. Simply place the lemon stuffed chicken over the stand and let it roast in this position. Makes for a crispy bird~ also very flavorful done this way too! Roasted Chicken served with a garden house salad and blistered cauliflower. A great anytime meal. Pre-heat oven to 400 degrees. Wash chicken inside and out with cold water and kosher salt. Pat dry. Place chicken on a roasting stand in a shallow pan. Add ½ Cup water, broth or dry white wine in the bottom of pan. Whisk together olive oil and lemon juice, herbs and garlic. Rub chicken with lemon oil mixture all around on the outside and then what’s leftover on the inside. Slow roasted method: Reduce oven to 250 degrees and roast uncovered approx. 2 hours. Chicken is done when juices run clear from pierced leg. Faster method: Roast chicken at 400 degrees for 1 hour. Check to see if done when juices run clear from pierced leg. No need to over cook, chicken will continue to cook once taken out from oven and covered. Otherwise if you cook too long, it might get too dried out. If chicken is getting too dark, place parchment paper over the top or tur down the oven temperature until chicken is done cooking. It should measure 160-degrees whe done. Remember the chicken continues to cook as it rests too. NOTE: Save your chicken bones! 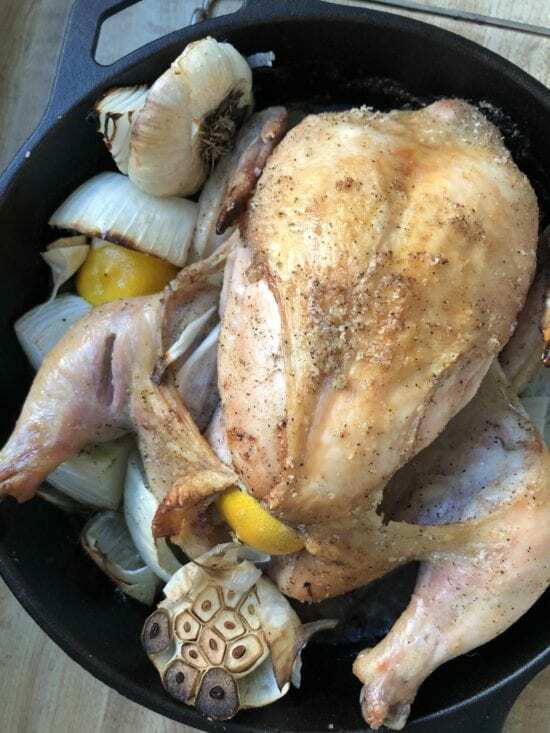 Make a quick chicken stock using the chicken carcass.